Receive an instant quote on some of our most popular t-shirts. There are so many custom printers around, but none quite like us. Whether you need a dozen printed shirts or thousands of shirts and fulfillment service, we do something for everyone. Learn more about our ordering process and what to expect when you partner with Emblemax. Emblemax was founded in 1991 as a tiny screen print shop known as Jam Graphics. 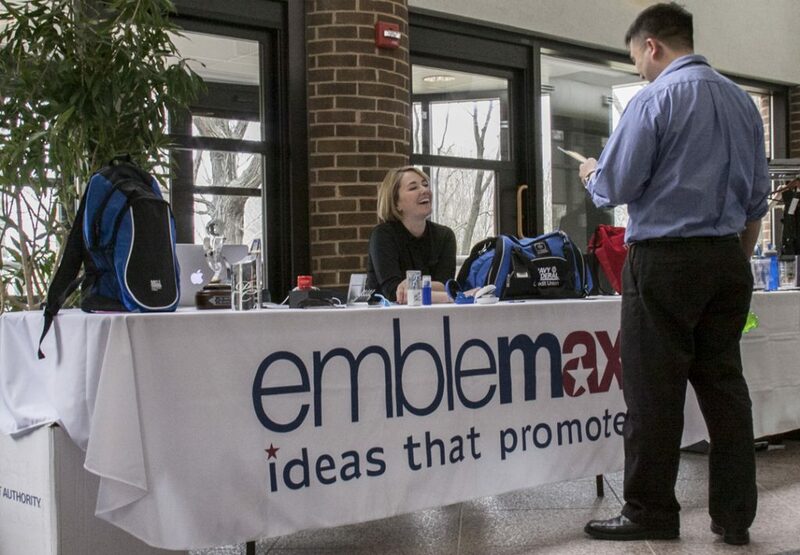 Originally the product of a college student’s love for art and t-shirts, Emblemax has grown and evolved into a full-service provider of integrated merchandising solutions including custom embroidery, screen printing, and more. Although we have tackled new ownership, acquisitions, and …..
You have always done an amazing job for me whenever I have asked – without a complaint – needless to say – I hope to work with you on our school order as we will be revamping the whole line of what we have! : ) Thank you again – I really appreciated you going out of your way – Emblemax has really gone out of their way for me! I found the boxes, and the pullovers look absolutely FANTASTIC! I wish you had a location in Fort Worth, Texas! You have been nothing short of wonderful thank you again for all of your help. The truck t-shirts went like gangbusters. We had kids trying to squeeze into sizes too small for them just to get one! Great job Emblemax! I wanted to thank you for the great job on the Tshirts…I know there was some last minute art-adjustments that needed to be made. I appreciate you all catching that and fixing it before the shirts were printed. I think this shirt is our best ever, the artwork looks great on the dark green shirt. Your kind service and excellent work is very much appreciated! I just wanted to let you know that our staff is over the moon about their new sweatshirts. Once again you all have done a wonderful job. I greatly appreciate all your help setting up the new logos. I just wanted to let you know how wonderful Joe has been with myriad orders from me to get us through 2 trade shows the first week of June. We had to create a new logo so all things had to be custom done with the new logo. Lots of clothing articles in lots of sizes all in short turn around times and deadlines. Also lots of giveaways which Joe helped us find and order. Joe handled everything we asked of him and everything arrived here on time and to spec. I just wanted you to know what a good job Joe has been doing for us. Thank you so much for all of your help and also trying to expedite the order! You have made it super easy for this first timer to go through this process! This is quite possibly the best fleece shirt ever! I wore it this evening outside and didn’t even notice the cold. The team is really going to love these. Thanks to you, I’m super excited! Thank you so much for all your hard work. You make me look good. Thank you for sending the great catalogs! They are wonderful. In addition, I want to thank you for your tremendous service. I ordered hats from Emblemax, and they are absolutely wonderful. We’ve ordered numerous marketing tools, but without a doubt yours is unanimously the cream of the crop. I’m looking forward to conducting business with Emblemax in the near future. You guys are great to do business with!!! The shirts and jacket have arrived and they are beautiful! You did a great job and I appreciate your help and getting them embroidered in time for the conference. Your customer service is stellar! Thank you both so very much. Emblemax has always been on target with prize delivery, price affordability, prize return/exchange, and customer service. Please keep them in mind in your future events! We loved the bags we had printed by Emblemax for our June event, and I wanted to see if you have any more of these in stock that we could order for an August event. I wanted to let you know how pleased I am with the shirts! They look amazing and I am so glad we went with the all cotton version. The art looks fabulous and the letters/numbers on the back are perfect. You are a pleasure to work with! I just wanted to let you know that we got our pens yesterday and we love them! Thank you so much for helping me with this project and I look forward to working with you again.